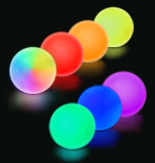 Juggling balls in a variety of materials for performance, stage, bouncing, and contact. 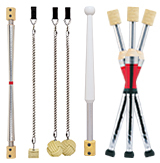 One piece and composite clubs in European and American Styles. Diabolos for beginners and professionals. includes instructional book or DVD. Juggling beanbags in a variety of sizes and fabrics. Ideal for learning or teaching. World standard for juggling knives. Classic scimitar design in stainless steel. Kite poi, Ball Poi, Sock Poi, Lighted Poi, Fire Poi, Meteors, and Lighted Meteors. 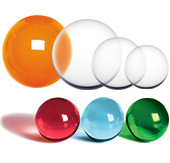 Acrylic contact juggling balls in clear, translucent and solid colors. 4 sizes. Devil Sticks made from hardwood decorated in variety of patterns, designs and colors. Spinning plates in plastic and aluminum for beginning and serious juugglers. Kevlar wicking, cord, rope and thread for fire juggling and fire eating. Kevlar wicking, cord, rope and thread, torches, poi, instructional books for fire juggling, fire eating and more. 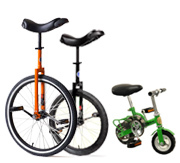 Professional quality unicycles in three sizes for riders of all ages and skills. Lightweight nylon scarves for learning and teaching the fundamentals of 3 object juggling. Nylon and leather bullwhips for whipcracking performance routines. 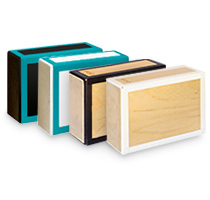 Cigar Boxes in polyethlyene and traditional wood construction. Highest quality wool felt hats in various styles for juggling manipulation. 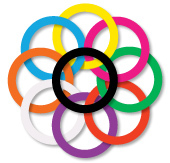 Durable, lightweight jugglng rings in a rainbow of colors. All cotton trick ropes for western styled lariat routines. New, all stainless shaker cups for nesting and manipulation routines. 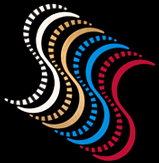 Traditional Ribbons used for twirling routines by gymnasts and jugglers. 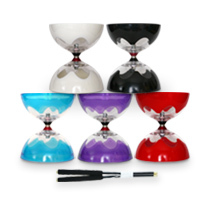 Rola Bola board sets for balancing and juggling routines. Flags for swinging in a choice of colors in China polysilk fabric. 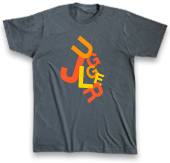 Juggling themed T-shirts in various designs, all in 100% heavyweight cotton. Nylon drawstring prop and ball bags - a lightweight solution for carrying your juggling equipment. Extensive Line of Juggling DVDs. Instructional, Performance and Documentary. 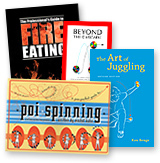 Books on every facet of juggling - instuctional and history. The traditional Japanese skill toy with thousands of trick variations.